Beam Spring switches were introduced in the 1970s. Their exceptionally complex capacitive mechanism and space consuming design produces legendary switch feel, but prohibitive manufacturing costs led IBM to phase them out in favor of cheaper designs. In many ways, they are the grandfather of modern clicky switches. 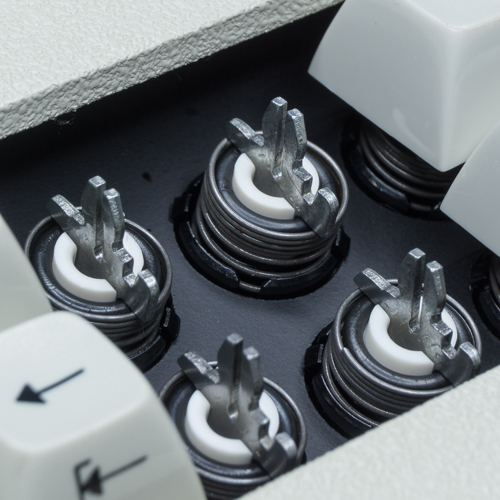 Model F and Model M buckling springs emulate certain Beam Spring design elements, and most clicky switches were an answer to their subsequent popularity. Beam Springs are extremely smooth, moderately tactile, and impressively loud. The gradual force ramp and sharp tactile drop off are notable. There are no sharp walls of tactility that stop one’s downstroke or upstroke movement. Rather, it feels as though one’s fingers are along for a comfortable ride. Bottom out harshness is mitigated by a rubber O-ring that is an integral part of the switch mechanism. Their intense, concise click is heavily influenced by case design. Beam Spring keyboards with thick metal cases tend to produce sharper, metallic clicks. Those with cavernous plastic shells, like the Displaywriter (or white whale), tend to amplify the click’s treble and midbass. The result is a single clean click accompanied by a reverberating “chunk” noise. Regardless, an enormous racket accompanies rapid typing of any sort. Beam Springs are extremely durable in clean environments, but dust and other environmental hazards can gum up their works quickly. Original beam springs used contamination shields, or thin plastic membranes below their keycaps, to keep grit out. Other issues, such as foam decay and rust, can also affect switch feel. If the shield is compromised, switch condition can be quite bad. Only complete disassembly, ultrasonic cleaning, and dry PTFE lubrication can restore the switches to a near-original feel.